Yesterday, such a kind comment from a woman named Mary Ellen, who kindly inquires if she can link to my blog. Here is how I reward her. I sneak up on her blog like a thief in the night and blatantly rip off the picture above. Here is Mary Ellen's nifty blog should you wish to see the picture in its original setting. It is highly recommended! Wow, what a picture! Note to out-of-towners: This is the kind of potholes we have in Buffalo and Niagara Falls. Our potholes could eat your potholes! Our local governments could eat your local governments! Our concert pianists could devour your concert pianists! I like this blogging business. I keep thinking it is like an 18th century fad. We all throw all these intimate thoughts on our lives up there for the world to see. We probe each other's comings and goings. This one guy Mark Weber I know only through Facebook, I peeked at his blog and it is all about how he plays gigs at nursing homes, along with his dad who plays drums. On New Year's Eve they did a gig at a Hamburg nursing home. 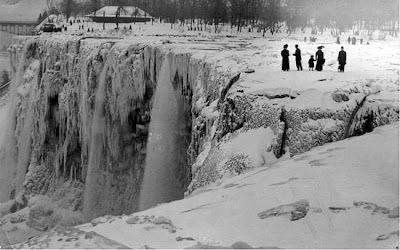 Then he writes: "After that my dad and I rushed north, past Buffalo to Niagara Falls." In a snowstorm! They rang in the New Year, looks like, with a crowd at the Niagara Falls nursing home. That is not a normal life! That is why I like his blog. Our new friend Mary Ellen does not lead a normal life either, posting pictures of gigantic potholes. Speaking of not leading a normal life, today after work is when I talk with the sister of Leonard Pennario's old flame. She (the sister) is the one who is going to Antarctica. She is going to Antarctica on Sunday. Imagine that! Imagine Antarctica. I do not even like to. I cannot imagine it there. It must feel weird and claustrophobic, being at the bottom of the world. It must be so dark and cold. Pennario once gave a concert in Alaska somewhere. He wrote in his diary: "This is the coldest and darkest place I have ever been." Clearly he had never been to Antarctica. Because surely Antarctica would be colder and darker. 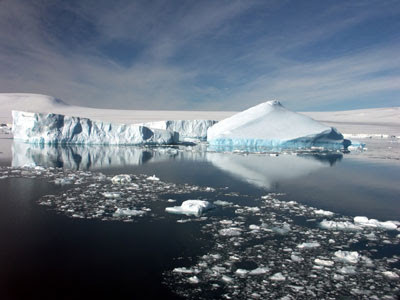 Here is a picture I found on the Internet of Antarctica. This picture is not from Mary Ellen's blog but she can feel free to steal it from me if she likes, in return for the one I took from her. It is impressive, though I do not see any potholes like ours. Speaking of potholes I have hit a pothole in my quest to get that bread machine up and rumbling. I was going to do that after work yesterday but instead I wound up on the phone with a friend of Pennario's who lives in Honolulu. This is the new me. Before, I used to come home from work and cook dinner or practice my Chopin etudes. Now, I am on the phone with a developer in Honolulu! That is what this friend does. I forgot to mention that. We talked forever. There is something about this friend, Chuck, that I like a lot. I liked him right away when I met him and his wife at Leonard's funeral last June. I remember Chuck as very handsome with dazzling blue eyes. He was extremely warm to me. He said, "You're the gal who was with him writing the book about him! We're already sold on you." Something like that. I was so grateful. Wow, remember that strange day? Remember that weird minister? Then months later we got that comment on that post from a Father Tom who was not the Father Tom we wrote about. How confusing was that? Two Father Toms and they meet on the Leonard Pennario biography blog. Chuck told me the greatest story of how he met Pennario, in 1963. They were at the beach club in Honolulu. And Pennario asked directions to this famous restaurant called the Willows. The next day he saw Chuck again and said, "Your directions took me to Pearl Harbor." Which was nowhere near the Willows! Pennario got to be friends with Chuck and his wife and at one point, Chuck asked his new acquaintance what he did for a living. "I'm a concert pianist," Pennario said. A few days after that, Chuck ran into a friend who managed a Tahitian band. "I just met this interesting guy who is a concert pianist," Chuck said. "Maybe you could manage him." The friend asked what the pianist's name and Chuck said, "Leonard Pennario." "Get out!" said the friend. "He's one of the greatest virtuosos in the world!" I hear so many stories like this about Pennario and I love him for it. He readily fell in with friends who didn't know much about music, and it didn't bother him. He did not shove what he did down your throat. For a concert pianist I think that is a great and glorious thing. What a journey today! I am just noticing that. We began in Niagara Falls, then went to Antarctica and now we are in Hawaii. And now I am back at my desk, listening to the guy next door scraping the ice off his car. That is what is in store for me too, alas and alack. Sometimes I have to remind myself that last year I missed the Buffalo winter. Aren't you folks getting that nasty snow storm today?